There is this legend in society about the strong girl who smiles for everyone else, but is breaking inside. It’s adhered as the kind of girl you would want to be….strong for everyone else, broken inside, but so brave for living on. This is downright ridiculous. I’m sorry, but I don’t want to be the girl that is brave on the outside, but breaking on the inside. I don’t want to be the girl with fake smiles for the world and only tears leftover. I don’t want to be this legendary girl that is so strong that she’s breaking! We’ve made hiding behind fake smiles a brave thing to do, but it’s actually not. It’s destructive, and it’s not worth it. It is not your job to be strong for everyone else. It is not your place to be the girl who never breaks down. You need to fall apart. You need to show weakness. You need the help of others. You need to be dependent. You need to confide in someone. You need to learn to trust. It is not brave to face the world alone. It is not courageous to bottle everything up and act strong for the people around you. You need people. Not just people, but friends. Your heart needs to overflow, express, hold, and be held. Get rid of this nonsense about being strong for everyone else, always smiling, and never breaking down. That’s unhealthy. We can’t solve all of life’s problems on our own. We need to learn to confide in a friend so we can be helped, advised, and listened to. Last time I checked, it’s pretty near impossible to sort out confusing, tangled emotional problems without someone else to help me separate all the knots. Proverbs 27: 9 Oil and perfume make the heart glad, and the sweetness of a friend comes from his earnest counsel. 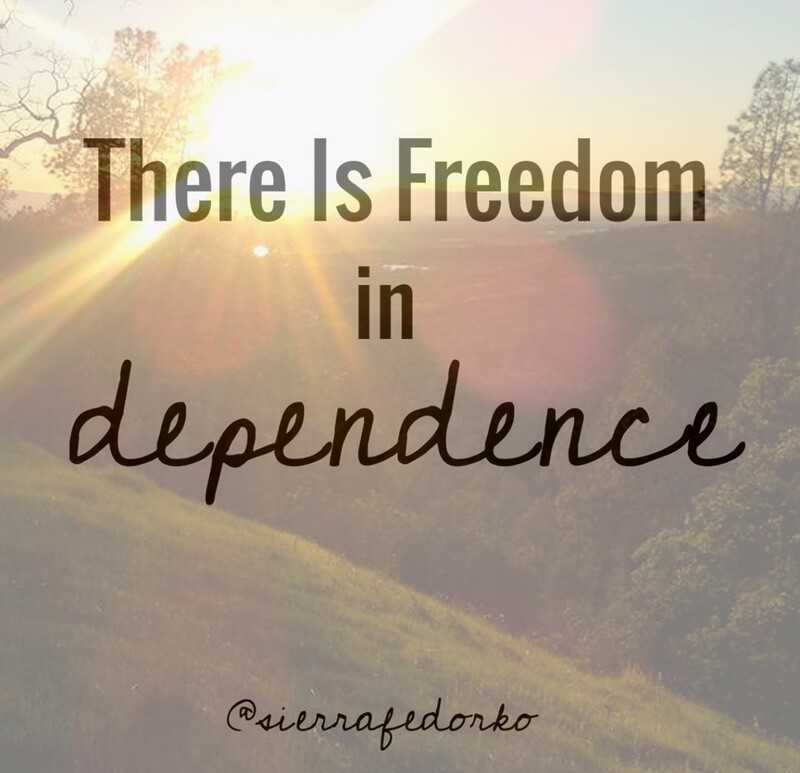 Dependence on a friend is liberating. In society today, dependence on others is looked down upon. According to the world, if you can’t accomplish everything alone, then you’re weak. To need anyone is essentially saying, I am weak. Well, guess what?! You are weak! You need a friend to help you when you fall, to celebrate the good times, to walk alongside you. And likewise, you need to be that friend. We are weak people, and there is no shame in needing help. There is freedom in depending on a close friend. There is freedom in verbally sharing your burdens with a close friend. And more than needing friends, you need God! God loves you and He does not look down on sorrow, heartbreak, and grief. You can cry. You can be full of sorrow, full of anguish, full of tears and have no shame. You can break down, because you are weak, you need help, and you need to be comforted. How many times can I say it?! You can break down beneath the weight of life and feel no shame! You were never meant to hold your life, and your heart, and then the whole world too. There is no shame in tears. It is what you do with the tears that makes all the difference. Break down, but break down allowing God to comfort you with His love. Let Him hold you with His truth. God never asked you to be the legendary strong girl that smiles all the time. He’s asked you to trust in Him. And sometimes, that means breaking down as you give Him all your tears, burdens, and worries. I Peter 5: 7 Casting all your anxieties on him, because he cares for you. There is no reason to continue with your fake smiles and “strong” persona. You can’t. Chances are, you aren’t even that good at acting like you have it all together. Because, humans can’t have it all together. < Previous Moving in May! This message really resonated within me today, Sierra. Thank you for putting it into words. Oh Hannah, I’m so thankful you found it helpful today. 🙂 God is with you!